The East District Council is one of thirteen such Seattle councils, organized by the City Department of Neighborhoods as a way for local neighborhood groups to share information and to help the Department to rate citizen applications for Neighborhood Matching Funds. We meet monthly, from 5:45 to 7:45 PM, typically in the Capitol Hill Library on the second Monday of the month. Our acting District Coordinator is Karen Ko (206-684-4054), while Tim Durkan is on sabatical. 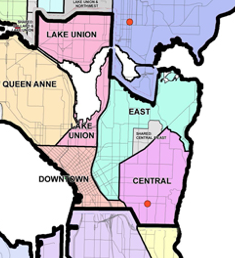 East District Boundaries, before Montlake rejoined the East District.